I would like to introduce you to our new second-year MSW intern from NYU Silver School of Social Work, Charlotte Sohr! She will be with us for the Spring Semester. 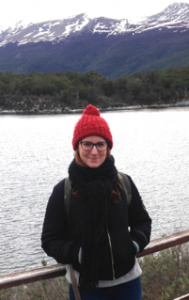 Charlotte was part of the second cohort of MSW student that went to Buenos Aires, Argentina for the Fall semester. We are excited to welcome her to our El Nido family! Welcome! Charolette, why did you choose El Nido? The staff at El Nido has fully devoted themselves to improving the social and educational conditions of young children growing up in adverse conditions. Literature and research today have all proven how important healthy attachments and a safe and stable environment are to early child development, and El Nido strives to assist mothers who need assistance in this. From the first day I walked into El Nido, I could see how the physical space alone, with its size and numerous books and toys, could provide a comfortable safe space for mothers and their children. Diapers, formula, clothing, books, all of these things cost money, and by providing mothers with these items, as well as educating them on healthy parenting, they are better able to provide a nurturing environment for their children. What do you want to learn from El Nido? From El Nido, I want to learn how to foster a creative and enriching environment that provides children with the tools they need to grow and thrive. El Nido’s focus on literacy, health, and emotional support are factors that many people, due to systems of oppression, are not afforded, and I want to be a part of the movement tackling this nationwide issue. I want El Nido to provide me with the knowledge of early child development and the factors that can nurture or hinder the aging process, as well as how to best support mothers.